While every Badgers football game is a victory in the metaphoric sense, a few times every season our victorious efforts are realized in what sports fans call, "a double-u" (1). 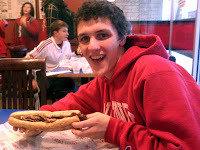 So after wooping it up at the last Badger's home football game, I could not think of a better way to celebrate a triumphant UW victory than by gorging myself on a philly cheesesteak at Big Red's Steaks. I have made a fair number of good calls in my life, but this one is up there with saying no to crack and resisting the temptation to say "what" again to Samuel L. Jackson (2). Like an eager child on a snowy Christmas morning, I peeled back the wrapping on my sandwich - and just like on Christmas, I was immediately disappointed. No Bionic Bunny walkie-talkies this year. In fact, socks. The bread was soggy on one end, a cardinal sin in any sandwich maven's book. I soon discovered after a few bites why this was; the bread held absolutely no crunch. With every bite, I felt the airy loaf deflate between my intrepid incisors. While it tasted good, I felt like I was eating the arm of an appetizing couch, not a philly cheesesteak. Not to mention that one bite of this hoagie's end contained only bread and air, the second occurrence of this unforgivable mis-steak (lol)! In contrast to the bread, the steak was not easily bitten asunder. While resilience is an admirable quality, every tough guy must have a soft side (3) and this is what Big Red's failed to deliver. Eating a philly cheesesteak should be a breezy little vacation getaway for your mouth, not a workout. All sinews aside, this steak was pretty average in taste. There was no bold meat savor, which was disappointing considering the abundance of steak juice (culprit of the soggy bread caper). Standalone, the meat could have used a little tenderness and a double dose of flavor, but did not lack in sheer volume, where Charley's fell short. This hoagie was nearly packed full, the way the good lord intended. Props to Big Red's here for offering a choice between Cheese Whiz and standard American cheese. Often called the cheese for people who don't like cheese, the great melting pot, somewhere between Colby and Cheddar, American cheese has rightly rectified itself as a mainstay in the cheese world. If there is one thing I found that Big Red's knows how to do, it is American cheese. The classic white (not that tainted yellow garbage) was melted perfectly over the sandwich's innards, wittingly avoiding an oily texture. The cheese had an instant and lingering flavor that was tucked inside the bun for a punch of much-needed brio with each bite. Hip-hip-huzzah to a well-deserved 9 in this category! To give due credit, this sandwich was much more evenly and heartily portioned than previously-reviewed cheesesteak(s). I entered the establishment hoggishly hungry and I left contently plump. The meat was admittedly tough, but this served to play off of the bread's fluff. However, every bite left a lonely cheese aftertaste, absent was the crucial meaty zest. Fortune smiled on Big Red's Steaks, because the cheese was delicious, otherwise this could have been an even more costly category. For god's sake man, this is a Philadelphia Cheesesteak, not a damned Subway Club! Do not hide the sandwich away in paper wrappings, celebrate it's beauty in the open air. Inside its paper tomb, the sandwich actually closely resembled the fictitious representation you might see on a picture-board menu, besides the visibly moist bread. At $6.50, this sandwich was impressively large and filling. Additionally, onions, mushrooms, and/or peppers could be included on the sandwich for what I assumed was no extra cost. Not a bad price for a decent meal. As Jenny of The Milkshakes and Pancakes Review (4) put it, "The lamps are pretty cool." Indeed they were, as were the various framed tokens and posters from the City of Brotherly Love. Needless to say, it felt good to be back in faux-Philadelphia again; well done Big Red's. The menu at this establishment offered à la carte sides, most of which were various fry options which cost about $3 each. I did seize the opportunity to witness a neighboring consumer eat his cheese-drenched fries and I can't say that I was tempted in the least to indulge myself. However, the fries were an appropriate side option for such a place and were in good supply. Always on the lookout for those nuances that make an eating experience unique, I left Big Red's empty-handed and heavy-hearted. Most notably, was the weak drink selection (I settled for cola) and when I asked for a drink, the cashier without asking charged me for and served me a large cup. Is this type of deliberate malfeasance standard practice? My bowed-in-shame head hopes that it is not. There was an interesting wall with painted graffiti, which almost earned the restaurant a one in this category, but as it is, congratulations on the Philly Cheesesteak Review's first zero! My cheesesteak at Big Red's Steaks made up points where others have failed by serving a fully-portioned, respectable-tasting sandwich. 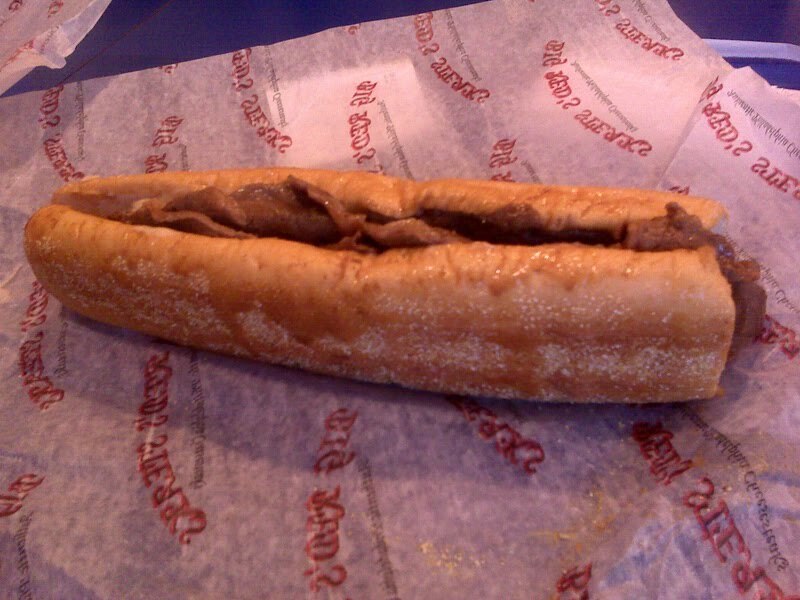 However, the flaws of the individual ingredients and the restaurant itself chipped away at the score, landing the sandwich right in the middle of the abundance of mediocrity in the cheesesteak business. 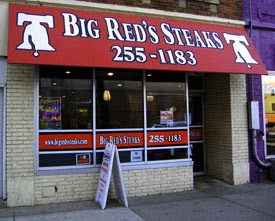 If you're looking for a quick bite to eat on the road, Big Red's is not bad, but it is certainly not, "the new home of Wisconsin's Best Cheesesteak," as it claims to be. "Neither a lofty degree of intelligence nor imagination nor both together go to the making of a sandwich. Love, love, love, that is the soul of the Philly Cheesesteak."